01 August 2012: WBW 2012 letter of supports from WHO and UNICEF are available for download. 6 Jun 2012: The publisher of Journal of Midwifery & Women's Health (the official journal of the American College of Nurse-Midwives) offers all the WBW celebrants the free access to their special issue (Volume 52, Issue 6) on breastfeeding issues. This will be open until the end of August 2012 in celebration of World Breastfeeding week. 10 May 2012: WBW 2012 Pledge Page is now available. You may also submit your pledge through WBW 2012 Pledge Form. 20 April 2012: WBW 2012 Logo in large resolution is now available at our Download Page . 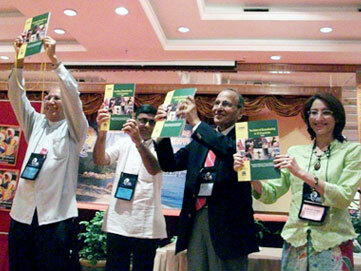 18 April 2012: WBW 2012 Pledge Form is now available at our Download Page . 17 April 2012: Congratulations to the WBW 2012 Photo Contest winners! Ten winning photos have been selected, see them Photo Contest Results Page. Greetings from the WABA Secretariat! We would like to thank all WBW celebrants from over 170 countries who celebrated WBW so successfully this year. We received 290 pledges for events taking place globally, involving more than 107,990 celebrants (to date). Congratulations to everyone involved! WABA is now pleased to announce the theme/slogan for WBW 2013 - 'BREASTFEEDING SUPPORT: CLOSE TO MOTHERS' focusing on Peer Counseling, which was discussed and decided at the WABA Global Breastfeeding Partners Meeting (GBPM) held in Delhi, 5-6 December 2012. The WABA Mother Support Task Force, led by Anne Batterjee, has been appointed Key Writer for the WBW 2013 Calendar Announcement and Action Folder, working with small team of WABA SC members, and Core Partner representatives. As Anne notes: "Fifty six years ago, seven breastfeeding mothers came together and realized that their abilities to breastfeed their own infants came from being provided with information, education and emotional support from each other. That so many other mothers who longed to breastfeed could be enabled to do so if only those around them, their Peers, had the knowledge and skills to be supportive. La Leche League International was launched, and Mother to Mother support was born... Women's social networks have major impact on their health related decisions. Women are often drawn to other women with whom they share life experiences, especially when those experiences relate to parenting. When new mothers have someone who can understand and identify with their experiences, they can better enjoy and cope with parenthood. A peer counselor is an invaluable partner with mothers in their journey through parenthood, helping them gain confidence in their ability to breastfeed. Peer Counselors model the idea of seeking information from others, which will help moms realize that the breastfeeding journey is a learning process for us all..."
The Calendar Announcement is currently being developed and should be ready for distribution in January 2013. So do keep a lookout for it. 20years ago, theWorld Alliance for Breastfeeding Action (WABA) launched its firstWorld BreastfeedingWeek (WBW) campaign with the theme: "Baby-Friendly Hospital Initiative". So much has happened in these 20 years, it is time to celebrate but also to look back, understand what has happened and why. Then plan what more can be done to support all women to be able to optimally feed and care for of their infants and young children. 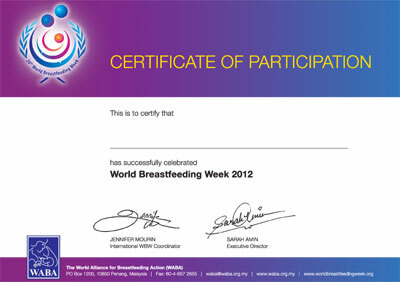 Submit your Pledge for World Breastfeeding Week 2012! 1. To recall what has happened in the past 20 years on infant and young child feeding (IYCF). 2. To celebrate successes and achievements nationally, regionally and globally and showcase national work at global level. 3. To assess the status of implementation of the Global Strategy for Infant and Young Child Feeding (GS). 4. To call for action to bridge the	remaining gaps in policy and programmes on breastfeeding and IYCF. 5. To draw public attention on the state of policy and programmes on breastfeeding and IYCF. The World Health Organisation (WHO) and the United Nations Children's Fund (UNICEF) jointly developed and launched the Global Strategy for Infant and Young Child Feeding (GS) in 2002 reaffirming the four Innocenti targets set in 1995, and setting additional targets. The GS has identified a clear need for optimal infant feeding practices in reducing malnutrition as well as poverty. It is based on a human rights approach and calls for the development of comprehensive national policies on infant and young child feeding. It provides guidance on how to protect, promote and support exclusive breastfeeding for first six months, and continued breastfeeding for two years or beyond together with adequate, appropriate and indigenous complementary feeding starting from the age of six months. How and Why we should monitor status of implementation of the Global Strategy? In 2004 - 2005 the International Baby Food Action Network (IBFAN) one of WABA's core partners launched the World Breastfeeding Trends Initiative (WBTi) , to track, assess and monitor the implementation of the Global Strategy. According to UNICEF's State of the World's Children Report 2011, 136.7 million babies are born worldwide and only 32.6 % of them are breastfed exclusively in the first six months. According to the WBTi assessment of 40 countries , most of the 40 countries do not have an effective IYCF policy with an adequate budget for implementation. To be able to increase breastfeeding rates, it is important to assess policies and programmes and take action accordingly. Get your WBW 2012 Certificate now by submitting your WBW 2012 reports. Manufacturers and distributors of baby foods, feeding bottles, teats and breast pumps do not have permission to use World Breastfeeding Week related text and logo. If they do, they will be deemed to have infringed our copy-righted material.